Mary Fons is Coming to Portland! OMG! It's Mary Fons--the woman behind Quilty magazine and TV show, the daughter of the inimitable Marianne Fons (you know, just the Fons & Porter founder), the author of Make and Love Quilts, as well as the editor of Dear Quilty and the talented wordsmith behind the Papergirl blog. Yeah, her. 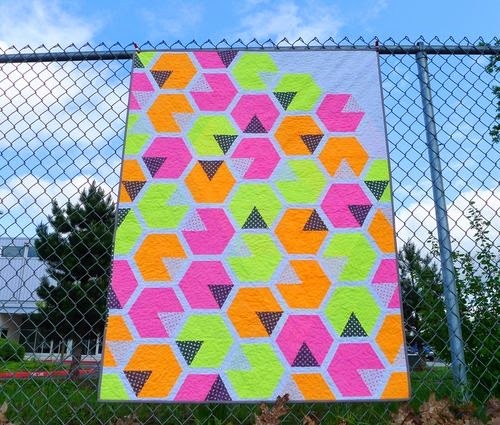 She's coming to town for the Portland Modern Quilt Guild in October and we can hardly wait! Join Mary On October 15, all day for a sewing workshop plus her afternoon lecture and trunk show (buy tickets now) or come for the afternoon lecture and trunk show only (buy tickets now). We hope you'll be able to join us for one of her workshops, plus Mary will be joining us for our October 15th meeting at 7pm. Meeting will be free for members and $10 for guests. Make sure to spread the word and tell all your quilting friends! If you can't get enough of Mary, she will be presenting other lectures and another quilt workshop at Fabric Depot on Saturday, October 17. We hope you'll be joining us this Thursday for our monthly get-together. It's the perfect opportunity to add to your fabric stash and pattern/book collection as members meet up for the bi-annual Swap and Sell. Don't forget to bring along your negative space mini and finished thread catchers! See you on Thursday at 7pm, St. Andrews Church. We can't wait to see you this Thursday for our monthly gathering. We'll be joined by local quilter, author and teacher Christina Cameli. Her second book, Step by Step Free Motion Quilting was recently released by Stash Books. Christina will be sharing her experiences, techniques and tips on how you, too, can do free-motion quilting on your domestic or a long-arm machine. We'll also be kicking off our thread catcher swatch, so bring your fabrics in a plastic baggie that has your name on it. Include your IG username, if you have one. We'll be exchanging thread catchers at the June meeting. When: May 21, 2015 7:00 p.m.
Modern Domestic Discount Modern Domestic will offer PMQG members 20% off their purchase on Thursday. They'll also be open until 7 p.m., so stop by before the meeting! 1408 NE Alberta St.
You could win this beauty on Thursday! It's party time, people! Celebrate the end of the year with your quilting friends. We'll have a potluck, holiday sale, a fundraising raffle, and fancy door prizes. Plus the holiday swap, and the final results of our 2014 Medallion Along! Holiday Sale: members will be selling fabric bundles, craft books, felted items, soap, pincushions, jewelry, and more. Holiday Swap gift if you're participating. It can be wrapped or not, but don't forget to include your name and your partner's name! Also if there's leftover fabric, return it to your partner. Modern Domestic will offer PMQG members 20% off their purchase of fabric and notions on Thursday, plus 25% off Elizabeth Hartman patterns. Kona Solids will be $6.50/yard (instead of $8.50) limited to 1/2 yard cuts or greater. Kona FQ’s will be $1.75 each, instead of $2.50. Modern Domestic will be open until 7 p.m. on Thursday, so stop by before the meeting! 1408 NE Alberta St. Ever wonder how the beautiful fabrics we work with are produced? Join us for the guild meeting next week and find out! PMQG member Teresa Coates, who worked at Robert Kaufman fabrics, will give us a behind-the-scenes look at the world of fabric manufacturing. We'll also be taking memberships for 2015, if you want to get that out of the way! Membership is $40 for individuals. We accept cash checks, and credit cards (note--there's a small charge for using a card). Your Holiday Swap fabric. We'll have extra baggies if you didn't get one last time. Charity donations (new toiletries and household goods) and/or quilts for Raphael House. We'll be accepting these through January, but if you want the shelter to receive your donations before Christmas, bring them now! Modern Domestic will offer PMQG members 20% off their purchase of fabric and notions on Thursday. They'll also be open until 7 p.m., so stop by before the meeting! 1408 NE Alberta St. Please join us for the guild meeting next week! It's going to be a little more casual, and tons of fun! • Your Medallion Along quilt-in-progress-- we'll reveal the final round this time! 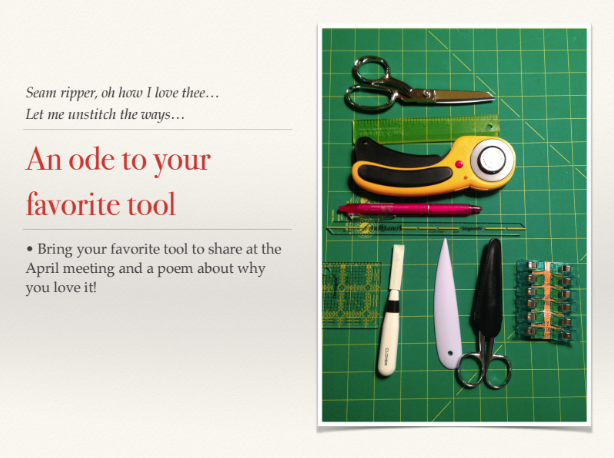 • Your quilts for show and tell, of course! Bring one of your first quilts, or one where you made a mistake. We'll share what went wrong and what we learned. 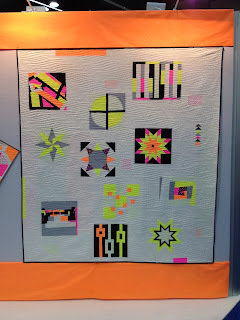 This is in addition to your regular show and tell of recently completed modern quilts! We'll also be presenting our charity quilts to Camp Erin ... it will be great to see the final result of all our hard work from the last three months! In conjunction with the theme of this meeting, Modern Domestic will offer PMQG members a discount on machine service ... details to come! Please join us for our June guild meeting, featuring mini-trunk shows from seven accomplished PMQG members. We're excited to see their quilts up close and hear about what modern quilting means to them! 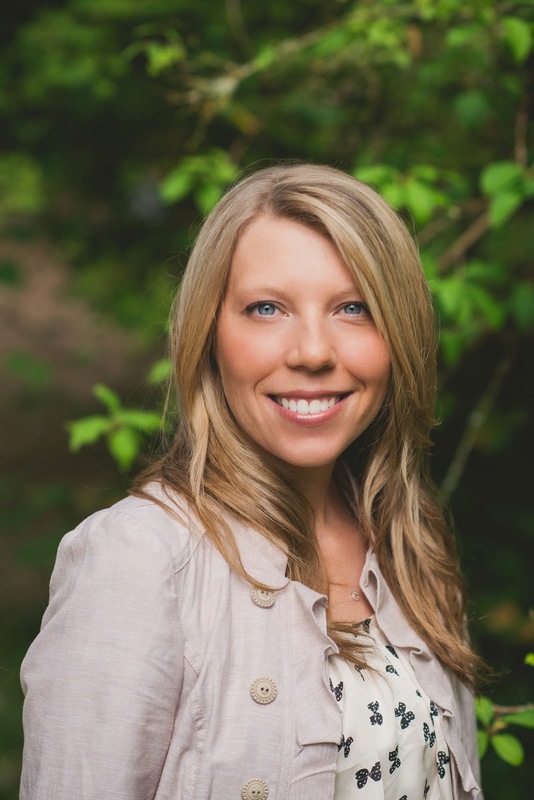 • Hot giveaways: books by Angela Walters and Kevin Kosbab, an Olfa gift set, and more! On the day of the meeting, ModernDomestic will offer PMQG members 20% off anything in the store (except machines and classes). Visit them at 1408 NE Alberta, just down the street from the guild meeting. Also, there’s a special PMQG discount for Katie Pedersen's classes at Modern Domestic on June 21 and 22. PMQG members receive $20 off an all-day class (regularly $120)--or you can take both classes for only $175 (regularly discounted to $200). Please call the store or sign up in person for this special offer. 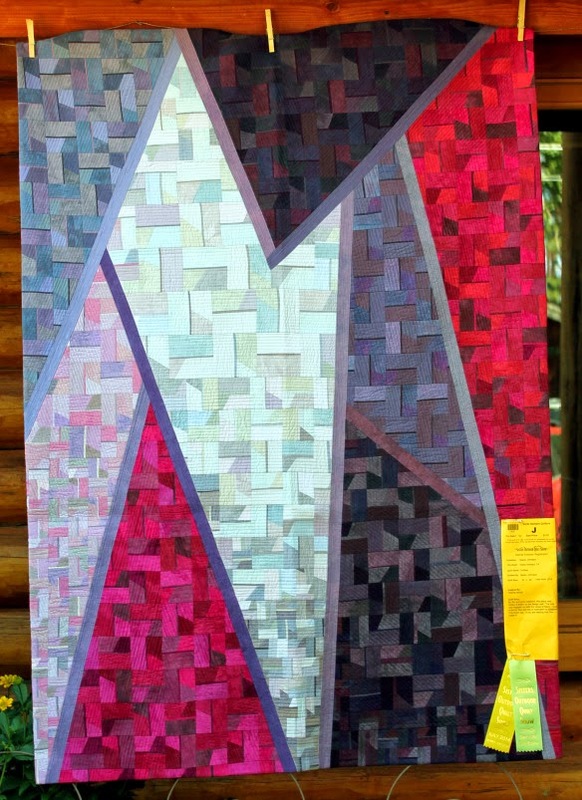 Our June meeting will feature mini trunk shows from seven accomplished PMQG members, who will show some of their work and talk about what modern quilting means to them. Who are these talented ladies, you ask? Read on—and check out their blogs for more! When I was growing up there was always some form of art in my life. My Granny painted; my Mom did ceramics, sewed, and eventually made art quilts. I received a BFA in painting from the Kansas City Art Institute and continued my "art career" in the retail industry as a makeup artist and working at Art Media after moving to Portland in 1993. Then I ventured into teaching art to children, and also started an Etsy business making knitting-needle holders. Then everything turned into kids and family. After my life calmed down a bit I was ready to be creative again. My goal was to start painting again but then I made my first quilt and I was hooked! I also started a blog in 2009 (here is my first post). I had no idea what I was doing, or that there were other bloggers doing exactly what I was doing—and then I found this wonderful community through PMQG. My quilting philosophy stems directly from my fine art background, where I painted a lot of abstract art landscapes and had a bold use of color. I approach a lot of my quilts by starting with sketches and also just improvising on my design wall with blocks of fabric. I love improv piecing and quilting but I also enjoy working from patterns some and focusing more on fabric choice and color. Of course I have always been addicted to fabric and hope to take things a step further by getting into fabric design in the future. 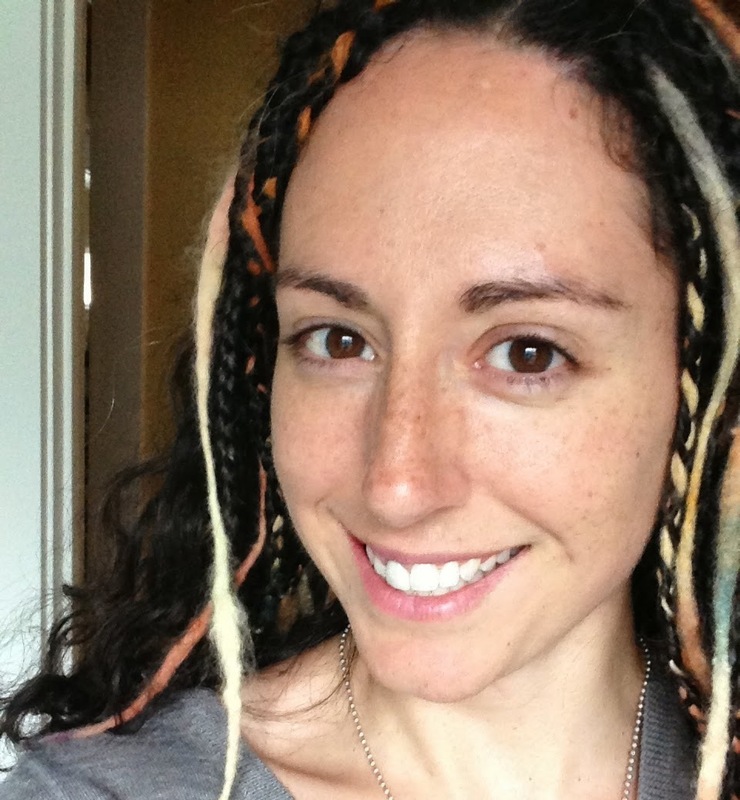 Jen Carlton Bailly is a self-taught sewist who learned to sew from online tutorials. Before she began sewing she graduated from the Art Institute of Seattle in fashion marketing. Having a love of textiles, fashion, and art, sewing/quilting was a natural progression and a quick addiction. She finds inspiration in everything from an old dresser drawer to a run-down Portland building. Currently working full-time from home as the communications manager for the Modern Quilt Guild, she spends every free minute sewing. Susan Beal is the author of seven books, including Modern Log Cabin Quilting, Sewing for all Seasons, Bead Simple, and Button It Up. 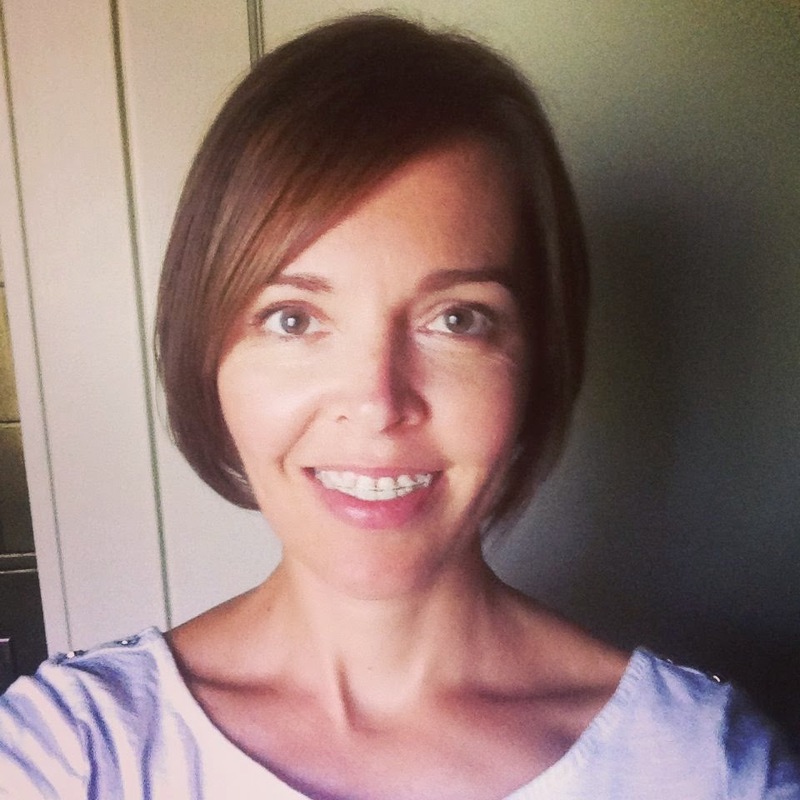 She’s also the historian for the Modern Quilt Guild, a contributing editor at Stitch magazine, and the mother of two little children, Pearl and Everett. Her Pearl's Rainbow Charm Bracelet (quilted by Nancy Stovall) is part of the PMQG Sisters Outdoor Quilt Show special exhibit for 2014, and a new version of the quilt pattern will be published in Scraps, Inc. later this year. Susan also teaches log cabin quilting classes for Creativebug, and her new book of sewing projects with Pendleton wool, Hand-Stitched Home, comes out in September. excited to try it. 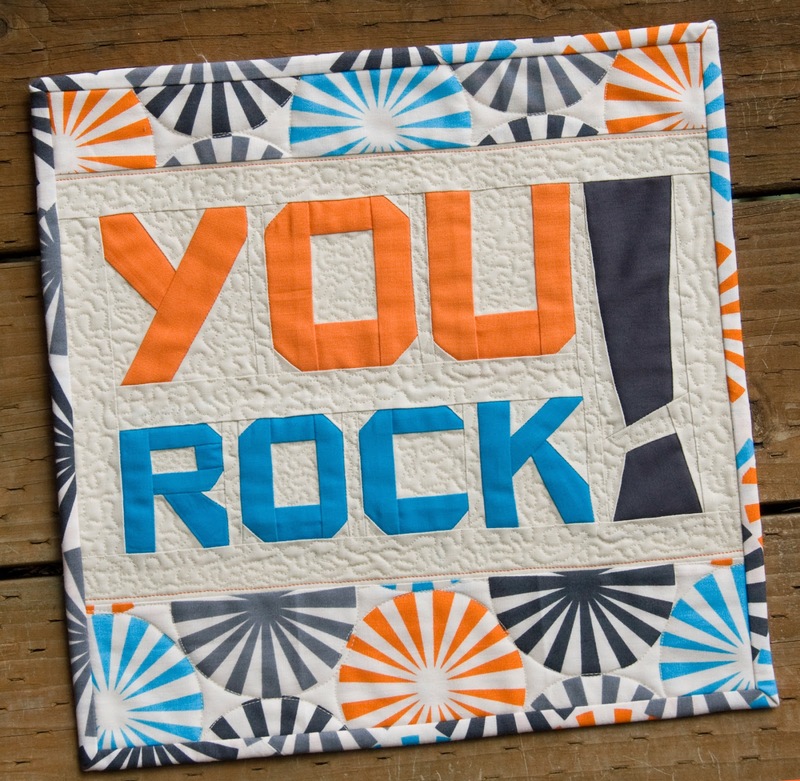 Christina believes quilting is for everyone, regardless of budget or style or experience. 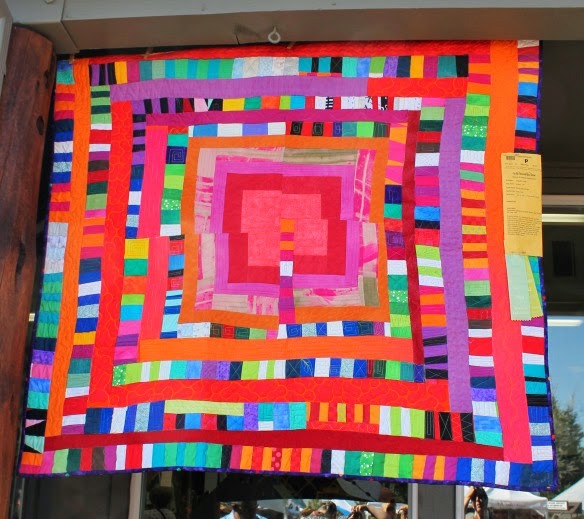 She sees quilting as an art—a living, breathing art that we are all creating together. Christina's special interest is in helping quilters become comfortable with free-motion quilting. She has a series of free-motion quilting tutorials on her blog, and is the author of “First Steps to Free-Motion Quilting: 24 Projects for Fearless Stitching”. 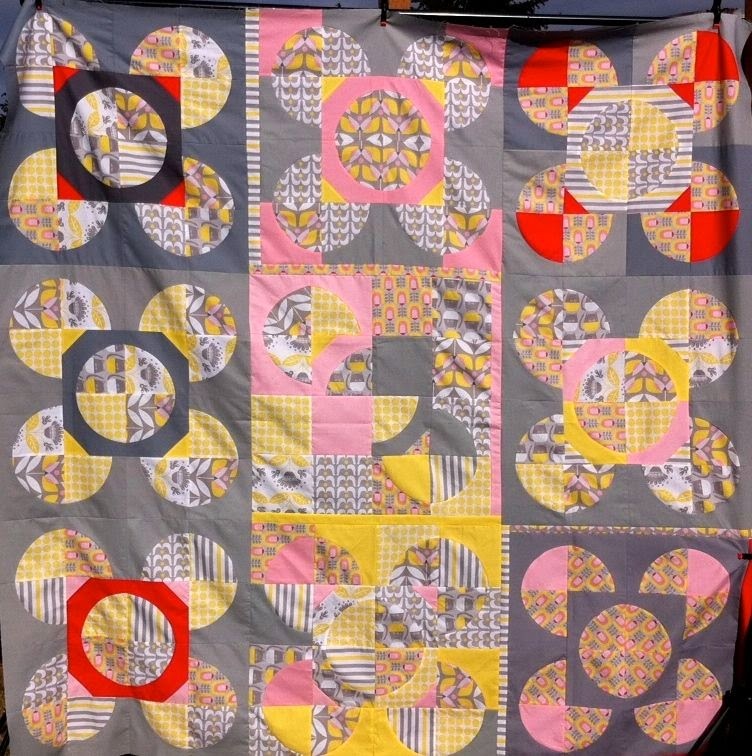 A founding member of the Portland Modern Quilt Guild, Rachel has been quilting ever since she found some squares, drafted her own pattern, and proceeded to make every mistake imaginable. After making a couple of hundred tops, quilting and finishing a couple hundred more, Rachel has grown her piecing and quilting skills and can easily communicate her vision of creating simple, artful utility quilts. Drawing on her art education, her love of Art Deco, and her ongoing delight with the simple circle, Rachel designs most of her own patchwork and applique. Rachel quilts freehand on an Innova 22" longarm machine. "I like the idea of the quilting being uniquely mine, no quilt is ever repeated exactly the same. And the idea of being able to reinterpret older quilting motifs from my own perspective gives me great joy. 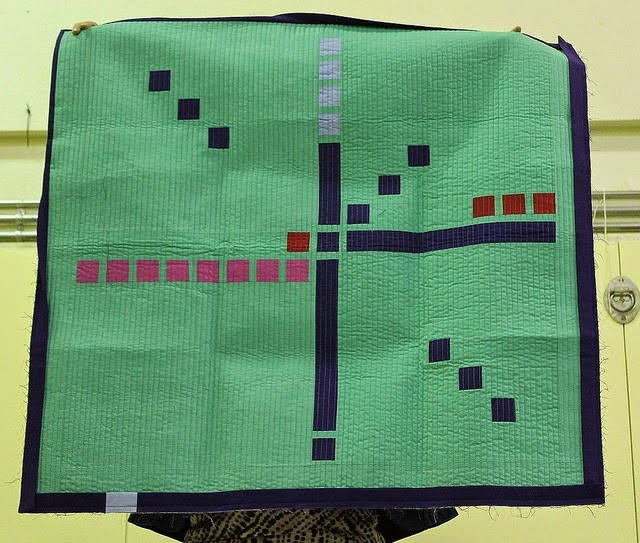 Quilting is something that gives me a chance to connect to the women before me, to connect with my own sense of Womanhood and to women around me." Rachel tends to work in series in her home studio, making bed quilts of various sizes, with each quilt as an opportunity to express herself. She has also collaborated with other artists and worked for manufacturers. I have been sewing since I was a little girl, when my mom gave me many pushes to try it. I can't say I was particularly interested, but I had a lot of fun making things with her and my grandmother. I loved to dissect objects and figure out how they were made and then make them myself, to my own specifications. I started quilting in my teens, but really went full force into it after my step dad died in my early 20s. It was my therapy, and still is today. I especially love drawing graphic quilts, figuring out the math and placement for a quilt top, and making it happen. I love the whole process. My quilting philosophy: Enjoy the process. Society has this instant gratification problem. We want it now. Quilting isn't an instant kind of thing. It takes time. You have to figure out your pattern, cut your fabric, sew your pieces, rip a few seams, square your blocks, assemble the top, assemble your backing, sandwich the quilt, quilt it, bind it... A lot goes into making a quilt. You're going to be working on it for awhile, so you should enjoy the process. See the beauty in each step. By taking your time and enjoying the process you will not only have a greater love for quilting, but also an end product you are happier with. Taking your time has never been a bad thing in any endeavor. I love surface design, unusual color combinations and clever cutting and piecing techniques. I have made over 100 rotary cut, paper pieced or improv quilts. I love quilts with fussy cut elements and traditional block designs reinterpreted in a modern way. I appreciate quilts that are full of pattern and color and showcase quality construction techniques. Please join us for our May guild meeting: Quilt Trivia edition! That's right, we're having a trivia party, hosted by a professional quizmistress. There will be teams. There will be prizes. There will be snacks. There will be fun. In other news, do you wish you could get together with a smaller group of quilt people and have some sewing fun? Make sure to read the "Small Groups" section below! All day on May 15, Modern Domestic is having a fat quarter sale for PMQG members! Buy four, get one free-- with no limit. The shop will also be open AFTER our meeting--they're staying open late just for us! Visit them at 1408 NE Alberta. They'll be open until 10:30! Do you wish you could get together with a small group of fellow quilters for some sewing fun? We're looking for volunteers to help kick off small groups around town. Your job would be to help organize a get-together for people in your area. If interested, please e-mail portlandmodernquiltguild@gmail.com with your name and neighborhood, and we'll give you more information. There are four spots left for our October retreat in the Columbia River Gorge. If you're interested, sign up ASAP! This Saturday! Bring your machine and your projects and come have some fun! 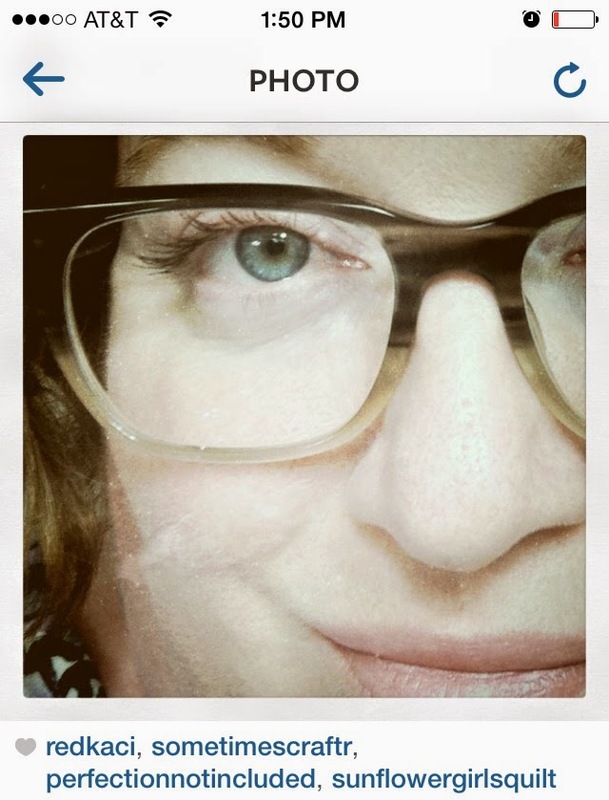 The textile designer and DIY maven will read from her new memoir, How to Catch a Frog. (Read Kelly's review!) This isn't a PMQG event; we just thought you might like it. 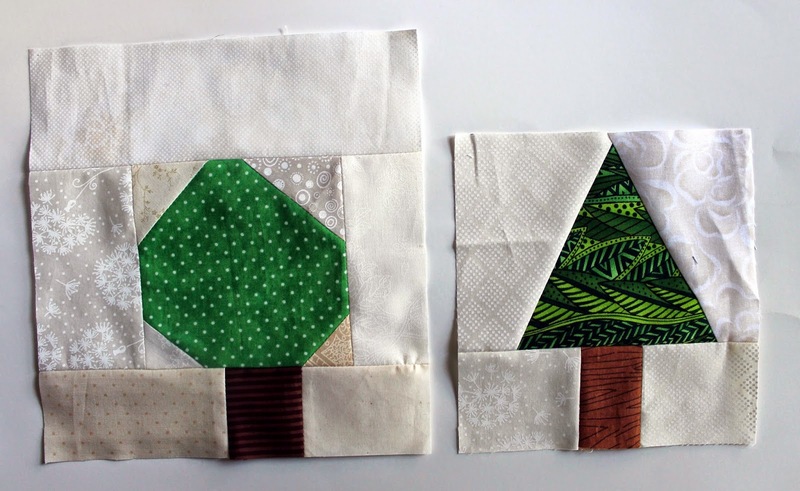 Learn to make a wonky tree, and help make a quilt for Camp Erin! Our charity this quarter is a camp for bereaved kids. We'll teach you to make the blocks and have some fun weekday sewing together! Questions? 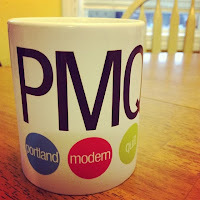 E-mail us at portlandmodernquiltguild@gmail.com. Submissions for the PMQG Special Exhibit at the Sisters Quilt Show are now due May 2. 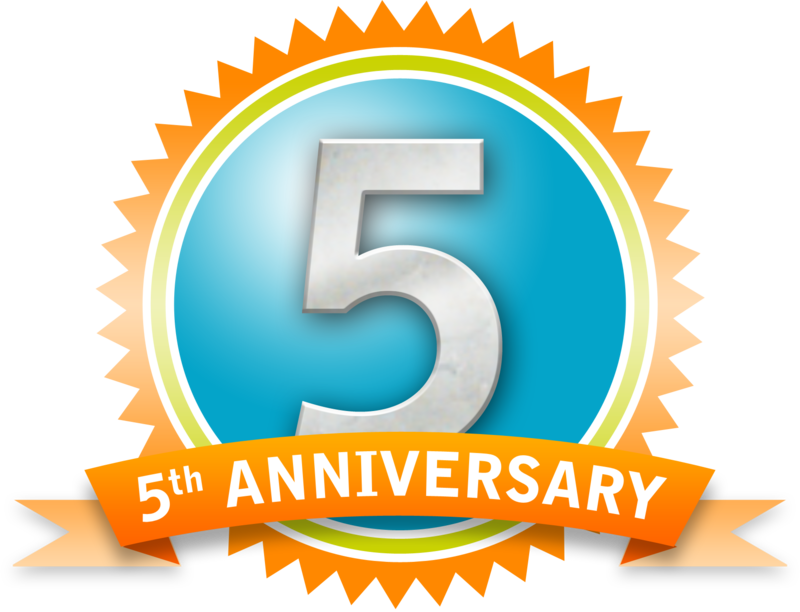 Modern Domestic will offer 25% off on Thursday as part of their anniversary sale. Visit them at 1408 NE Alberta—just down the street from St. Andrews! Scrappy notecards made at our most recent Sew Day! Cupcake potluck celebrating 4 years of PMQG! As announced earlier, we are now charging non-members to attend meetings. 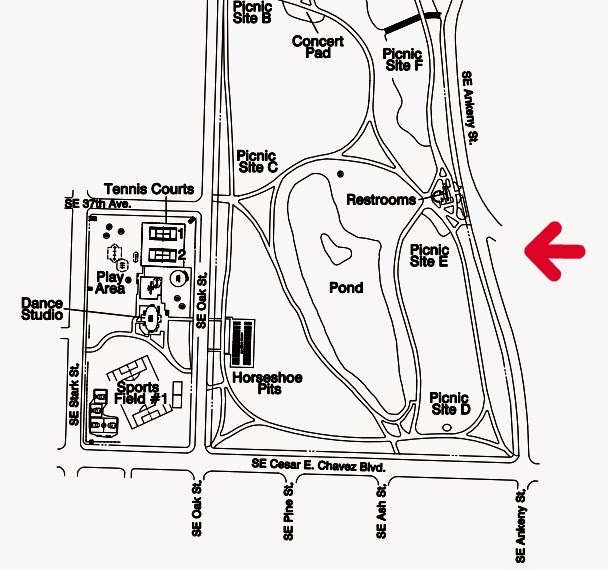 The first visit is free, but after that each meeting is $5. Guild membership is $40 cash/check or $41.50 credit, payable at the meeting. All attendees: to speed up the entry process, when you arrive at the meeting, guests and members renewals will be in one line and members will be in another line. Please have your PMQG membership cards out so you can be checked in and receive your raffle ticket(s)! If you forget your membership card we will also have a membership list to check. Modern Domestic has a deal for PMQG members on the day of the meeting: buy a yard of fabric, get a free fat quarter of your choice! They're at 1408 NE Alberta—just down the street from St. Andrews Church. Monday, March 31, 10 a.m.-5 p.m.
Come help make quilts for Camp Erin, the retreat for grieving children! Happy New Year! It’s time to get inspired, connect with other quilters … and resolve to make more quilts! You can do all three at our January guild meeting! Cash or check in the amount of $40 for 2014 membership, if you haven’t renewed already. If you would like to pay with debit or credit card, the price is $41.50 to cover fees. PMQG members get 20% off at Modern Domestic the day of the meeting! Visit them at 1408 NE Alberta—just down the street from St. Andrews Church. Friends and non-members welcome. We hope to see you there! Party! Raffle! Swap + Sell! December's meeting is, as always, a week early due to the Holidays. Join us the second Wednesday in December! Members, Non-members and family members invited! The party will be in the Community Center, which is behind the main Church building. There are two parking lots. December is our annual Holiday Party! A-L, please bring a savory dish. M-Z, please bring a sweet dish. The officers will supply non-alcoholic drinks. You may bring your own alcoholic drinks if you like. Raffle! 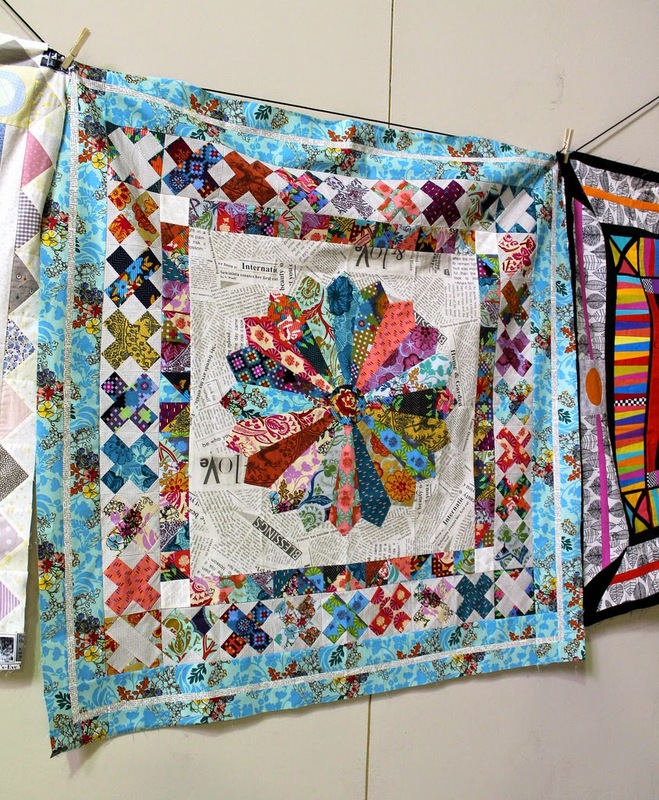 Two different group guild quilts will be raffled off to help support PMQG programs and membership costs. Tickets are $5 each or 5 for $20. Cash only. Your completed swap item for your swap partner! Cash or check in the amount of $40 for 2014 membership. If you would like to pay with debit or credit card, the price is $41.50 to cover fees. Cash for raffles, $5 a ticket. The proceeds will go to support PMQG. Money to purchase and/or items to sell for the Swap and Sell! It's almost time for November's meeting! Stagecraft Bldg. 1302 NW Kearney St.
We will have a member holding the door open until 7:00, after that someone will check the door every 5-10 minutes until 7:30. Show and Tell--at the beginning of the meeting! If you haven't picked up your Riley Blake fabric yet, it will be available. The deadline has been extended to February 17th, 2014, check out the MQG site to read about it! Note: The MQG site states that all entries must be quilted. Charms for our Fussy Cut Charm swap! Bring as many fussy cut charms (5 inch squares, with a design centered in the middle) as you like, and you will take home as many as you brought. Your stuffed baggie of fabric for our December Swap! If you missed getting a baggie at last month's meeting but would like to participate, just fill a sandwich sized ziplock bag with your favorite fabrics and a note with your name, Pinterest/Wists/Flickr faves (if you have), and a few ideas for items you might like. Doll Quilts for the OBT Doll Quilt Challenge! The November meeting is our deadline for this. Hand in your doll quilts and receive your vouchers. Charity BOMs from last month. October was Susan Beal's Picnic String Quilt Block from her new book, Sewing for all Seasons. October's meeting is almost upon us. We look forward to seeing you there! A presentation by Katie Pedersen of Sew Katie Did. PMQG members can still sign up for her Modern Domestic class (and get 10% off!) on Modern Crazy Piecing. A BOM by Susan Beal from her new book, Sewing for all Seasons. Don't forget to keep working on your OBT Doll Quilt Challenge! We will be collecting these at the November meeting. We will have more fabric from Shannon Fabrics available to use in the doll quilts at our October meeting.